Rainy Day Activities In Washington D.C.
Washington DC is the place to be on a rainy day. You could spend an entire rainy day exploring just one of the immense and compelling world-class museums in America’s capital. The selections below, clustered by area to keep you dry by minimizing travel, appeal to a wide range of interests. Smithsonian museums dominate the National Mall. And, admission is free. 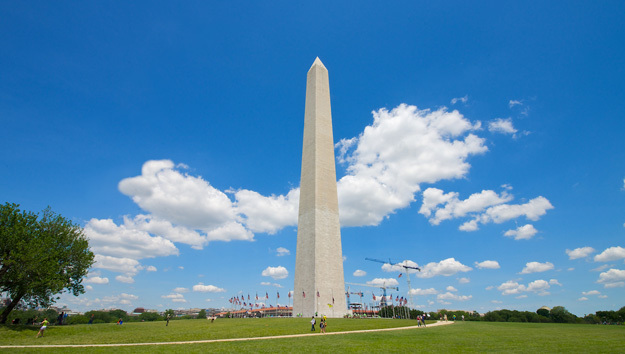 The most popular are the National Air and Space Museum and the Museum of Natural History. In each, endless galleries filled with vast collections engage adults and children for at least a half a day. A third, the National American History Museum is a good choice for history buffs. National Air & Space Museum. There is a definite wow factor in the vast hangar-like space of 23 astounding galleries. Immediately upon entry, Space, the Universe and man’s quest to explore the skies are on exhibit high and low. Aircraft and spacecraft are suspended overhead, and missiles and rockets stretch out full length. Pore over thousands of flight-related artifacts on exhibit and explore the Universe in the Planetarium. Get tickets in advance for superb films shown on a 5-story high screen in popular IMAX Theater. Seats fill up fast. Museum of Natural History. From the biggest mammal to the smallest insect, terrestrial life is on exhibit in the massive space. Ancient and modern mammals, birds, amphibians, reptiles, insects, sea creatures, rocks, gems, fossils and dinosaurs are in plain view. Fascinating exhibits focus on human origins and the development of cultures. National American History Museum. Journey through American life and ingenuity, from everyday gadgets to extraordinary inventions. History buffs and gadget gurus enjoy this journey through American life and ingenuity, from the everyday to the extraordinary. Artifact-filled exhibits tie together the narrative of the country’s cultural, social, technological and political experience. Hip, interesting Penn Quarter is the place to go for a diversity of experiences on any day, rain or shine. 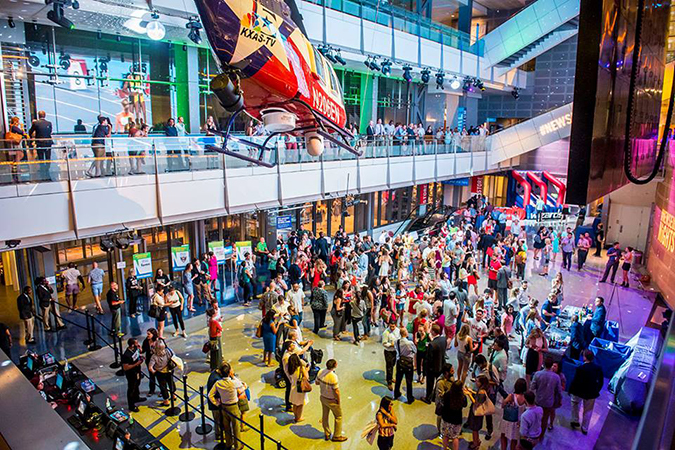 Two of the most popular and interactive museums in D.C. are in Penn Quarter. For travelers with teenagers and young adults, they are perfect rainy day choices. Newseum. Seven levels, 15 theaters and 15 galleries packed with dynamic interactive exhibits explore the social, historical an political importance of the U.S. Constitution’s First Amendment. Using different engaging techniques – movies, audio, written word, and games – The Newseum is fun, thought-provoking and compelling. An added bonus: views from the 6th floor are phenomenal. International Spy Museum. Uncover the shadowy world of the invisible profession. See the largest collection of international espionage artifacts in the world. Hear chilling stories of individual spies and their missions. Discover the impact of the undercover world on historical events. Test your spy skills by adopting a cover, becoming a spy and breaking codes! In the Penn Quarter, art lovers can indulge in great art twice without getting wet in two compelling museums in one building. American Art Museum. One of the largest collections of American art in the world includes the works of some of America’s renowned artists – John Singleton Copley, Winslow Home, Georgia O’Keeffe, Andy Warhol. Through the diversity of their art, the vision, tone, temperament and culture of America is expressed. National Portrait Gallery. Although the heart of the Portrait Gallery is the nation’s only complete collection of presidential portraits outside the White House, the intriguing stories told through paintings, sculpture, photos and prints about people who have shaped America is awesome. Curated in ways that connect individuals -poets, presidents, artists, actors, activists, musicians, visionaries, sports figures, inventors, writers, entrepreneurs – to the narrative of a specific theme, makes each gallery a powerful experience. Art comes in many forms. It can be wax. In Penn Quarter, Madame Tussauds takes the art of creating realistic life-size figures out of wax to a whole new level. Rubbing elbows with A-list celebrities and world leaders and to be able to take selfies with them is a great way to keep kids of all ages totally engaged on a rainy day. Spending time in the intimacy of a gorgeous house museum is a nice change of pace, especially on a rainy day. The place to do this is the DuPont Circle neighborhood. Often overlooked by visitors overwhelmed with spectacular offerings in and around the National Mall, it’s a lovely D.C. experience. The elegant cosmopolitan neighborhood surrounding a traffic circle centered by iconic DuPont Fountain, has a great local vibe, magnificent homes, many of them along Embassy Row, unique shops and good restaurants. A renowned art museum housed in a mansion, and two house museums are Washington’s hidden gems. The Phillips Collection. America’s first museum of Modern art has a collection of over 4000 works of art created before 1945, from Renoir to Rothko and Georgia O’Keeffe to Jacob Lawrence. The intimate setting of the former home of museum founder Duncan Phillips creates a special atmosphere in which to view priceless art. Sunday concerts at 4 pm are a local favorite. Anderson House. Walking through the exquisite Beaux Arts mansion is a memorable look at life in the nation’s capital in the early 1900s. Built for American diplomat, Larz Anderson and his philanthropist wife, Isabel, it was the Washington high society place to see and be seen. Now owned by Society of the Cincinnati, the focus of the the exhibits in on the Revolution-era. Rare books, manuscripts, maps, graphic arts, and artifacts focus on the people and events of the American Revolution and the art of war in the 18th century. Woodrow Wilson House. Tucked away among embassies and mansions, the smaller scale 1920s Georgian Revival home where the 28th President of the United States spent his last years, is a journey back in time. The house remains as it was, and presidential photographs, artifacts and memorabilia throughout the house are an interesting personal glimpse into the Wilson presidency. DuPont Circle Insider Tip: Kramer Books and Afterword Café. Good indie bookstores are rarities and this gem is the perfect stop on a rainy day. Comfy, funky and loaded with books, it opens early and stays open late. Stop for coffee or tea and a bite to eat in Afterwords Café, which also serves a classic American brunch all weekend. 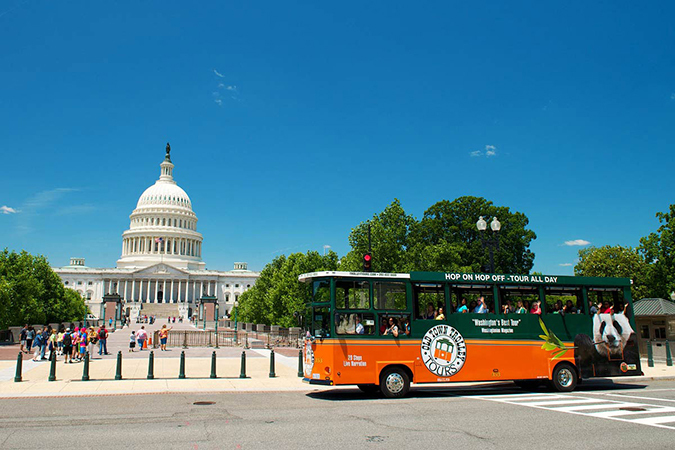 Old Town Trolley Tours of Washington, D.C. Regardless of weather conditions, first time visitors should take a narrated sightseeing tour to get oriented with the venue-packed city and decide what to do. It’s also a great way to spend a couple of hours on a rainy day. Hop on, relax, see the sites, and learn about everything D.C. on a spin around the capital city protected from the elements. Stay on for the complete 2 hour tour or, weather permitting, hop off at any of the stops to explore neighborhoods and visit some of the city’s amazing places. If a drizzly night has ruined your plans, don’ despair. Take the Old Town Trolley’s Monuments by Moonlight tour. The evening ride past all the important monuments and memorials, beautiful and moving when illuminated by white light, is a spectacular Washington experience. Comments Off on Rainy Day Activities In Washington D.C.